I have Samsung Galaxy Note N7000 with rooted android ICS 4.0.3 with super user access. Connecting of mobile with laptop via USB tethering is very smooth without any problem but problem starts after few minutes ( may be 10 minutes or may be 30 or more minutes ) when my Google chrome start showing DNS issue. I thought my ISP having some DNS server problem so I added 8.8.8.8 & 8.8.4.4 ( Google DNS server ) as DNS server address in setting of network connection but this could not solve the probelm. I opened browser in my Samsung note, it was working well without any problem , even all other applications in mobile were working well. I disabled and enabled tethering and data connection in mobile but without success. Next I rebooted my laptop ( having window 7 premium ) but this also could not solve problem, I even tried ubuntu OS but without any success. Finally I turned my Samsung note off and after few second I turned it on ( not simple restarting – it is turn off then turn on ), to my surprise problem was solved. But after few minutes problem reappeared so again I turn off and on my mobile and problem solved again, process continued. I thought it is DNS cache problem so I tried different application like SetDNS to change DNS server in mobile connection but with out any success. Finally I done some test ( when there was connectivity problem ) to know exact problem. this result mean that there is no DNS problem but there is connectivity problem between mobile modem and laptop. finally I added above values in connection setting ( will explain in detail below ) and started using internet on laptop, again after few minutes same problem occurred, this time I simply unchecked and checked the tether option in mobile and this solved my problem( without restarting the mobile ). So No need to reboot the mobile, just one click can solve the problem ( we need driver update in mobile to permanent solve this problem). fill the setting as shown above in image, matching with results you got with ipconfig command. 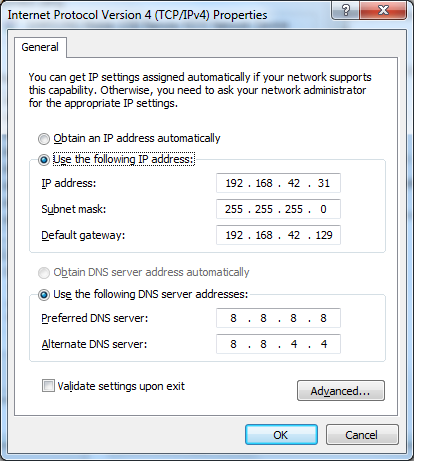 you can use DNS server setting same as shown above. Click Ok on both windows which appeared and you have done !!!! your internet issue will get solved ! !